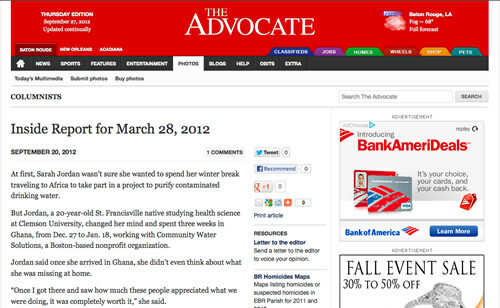 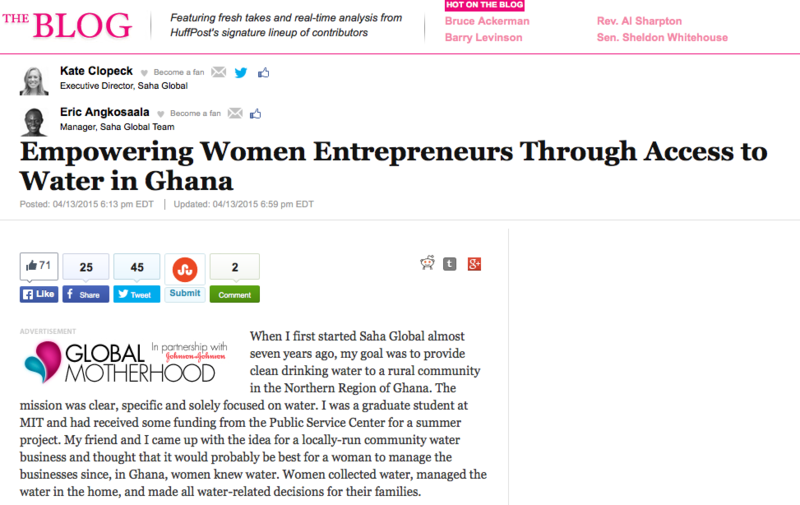 Check out Saha in the news! 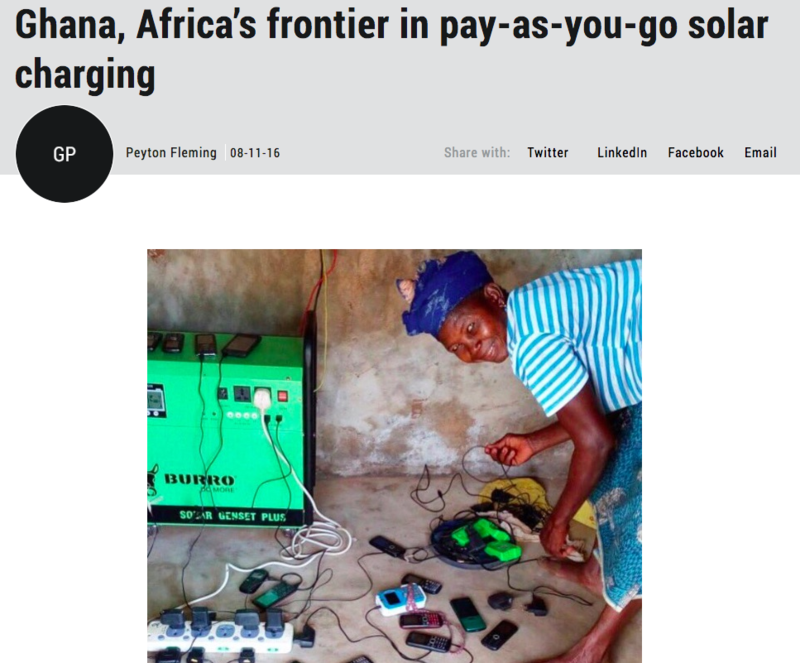 Peyton Fleming of Ceres features the Saha solar business in Kpenshegu in his piece for the Energy and Carbon blog. 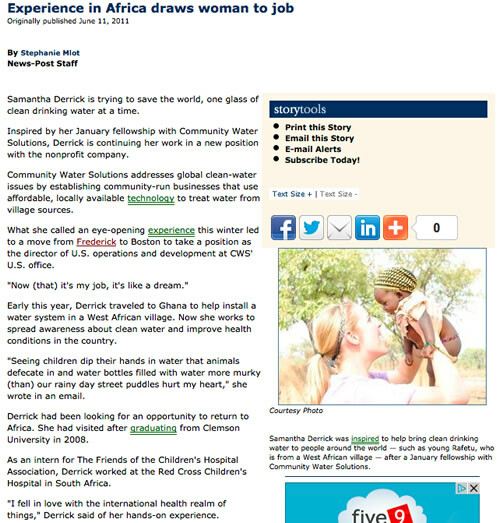 Peyton Fleming of Ceres shares his experience visiting a Saha water business in Yepala for the Huffington Post. 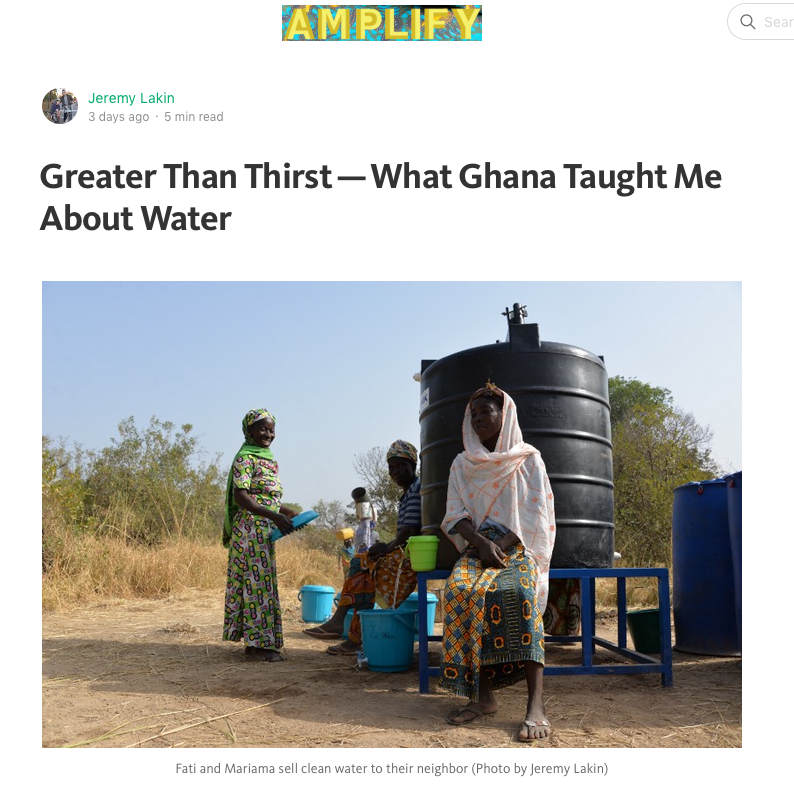 A insightful World Water Day article published on Amplify titled “Greater Than Thirst — What Ghana Taught Me About Water” by 2016 Winter Water Field Rep, Jeremy Lakin. 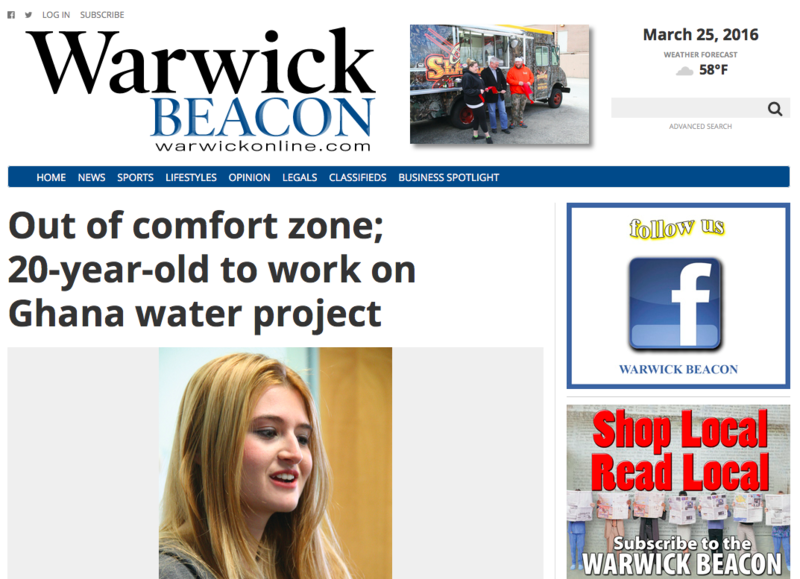 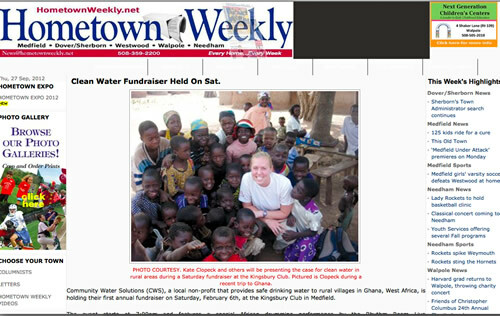 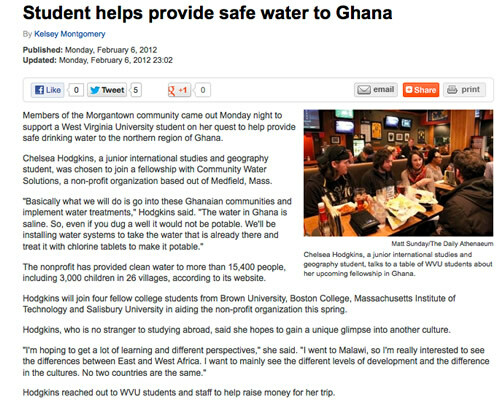 2016 Summer Water Field Rep, Jennifer Scotti, sits down with Warwick Beacon to talk about her upcoming trip to Ghana where she will help up implement a clean water business in a rural village. 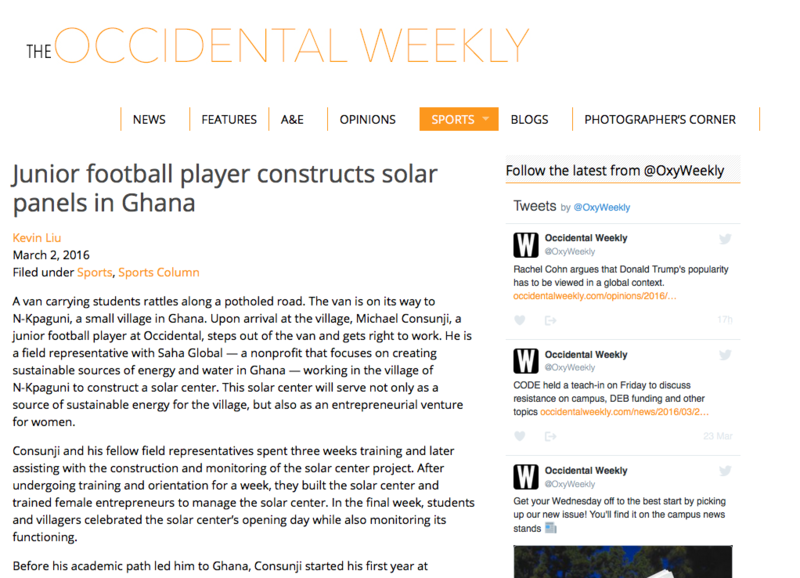 The Occidental Weekly interviews Michael Consunji about his time working in Ghana during his Winter break to bring a solar charging business to the village of N-Kpaguni. 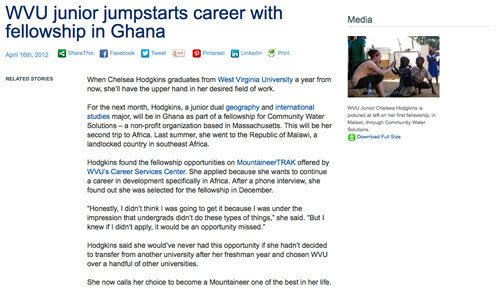 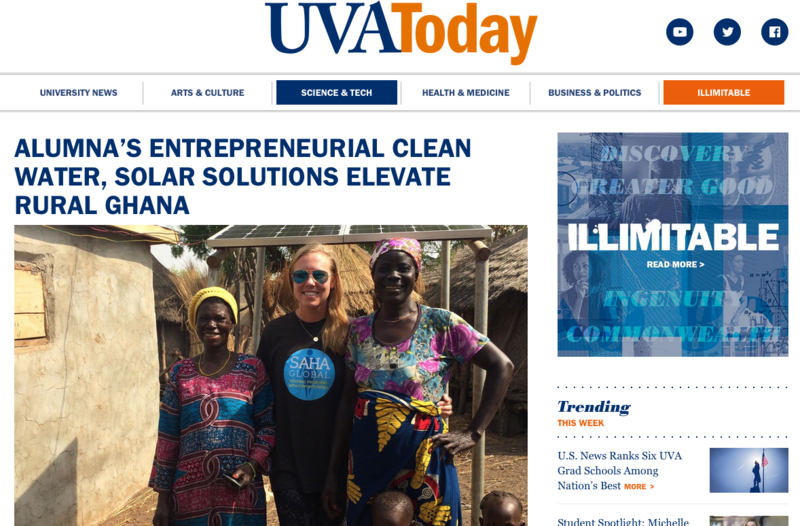 Hear from Executive Director & Co-founder, Kate Cincotta, in an article titled “Alumna’s Entrepreneurial Clean Water, Solar Solutions Elevate Rural Ghana” on UVAToday. 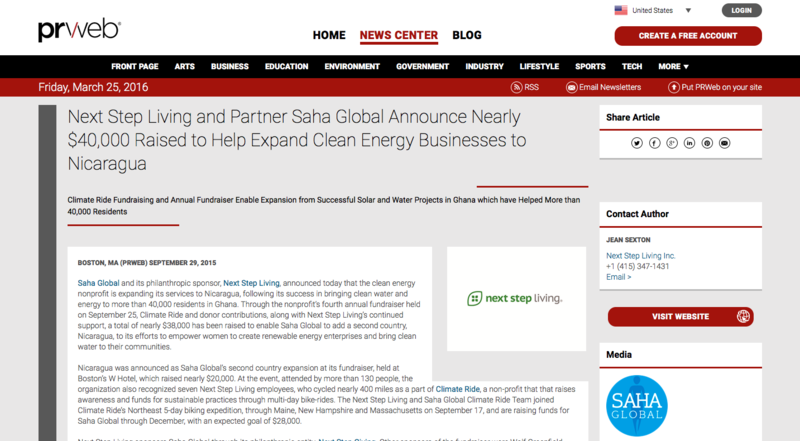 Next Step Living’s Climate Ride and the Annual Saha Benefit make our expansion to Nicaragua more a reality, read more details on the PRweb. 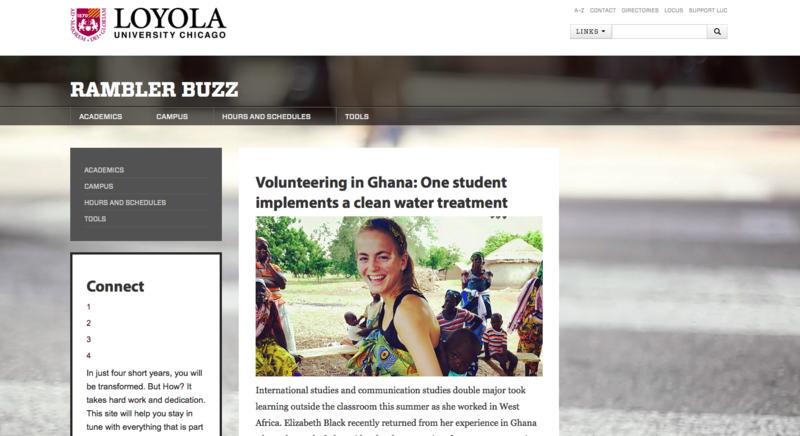 Loyola University Chicago’s Rambler Buzz interview 2015 Summer Water Field Rep, Elizabeth Black, about her time in Ghana. 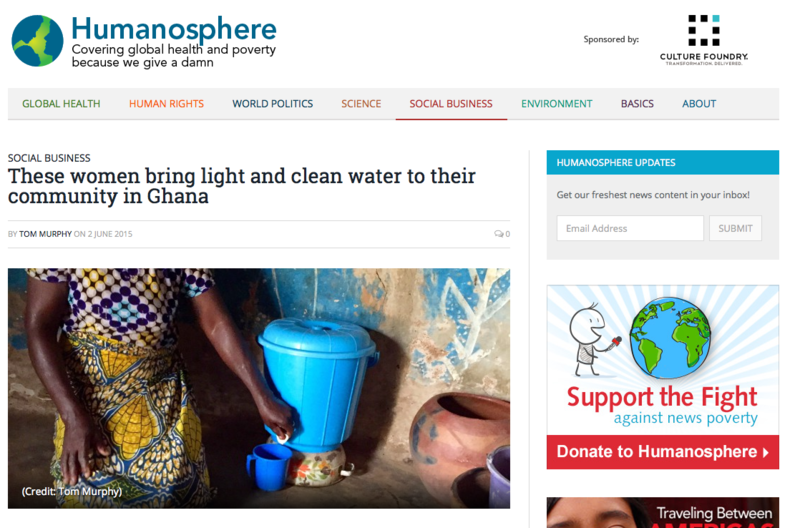 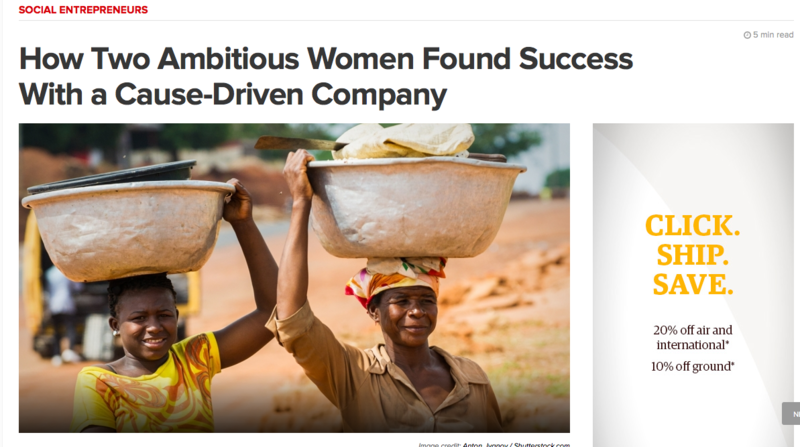 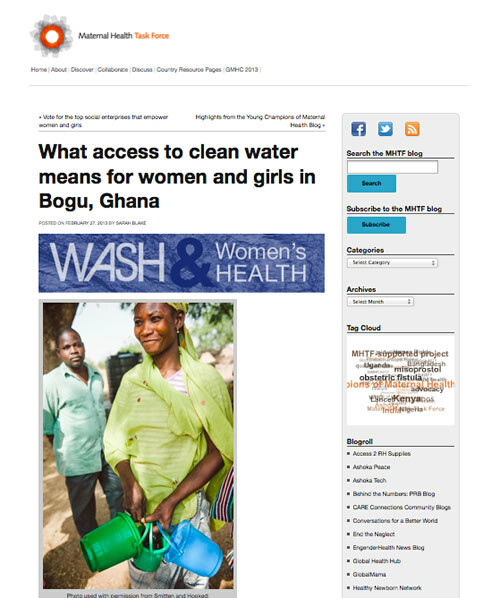 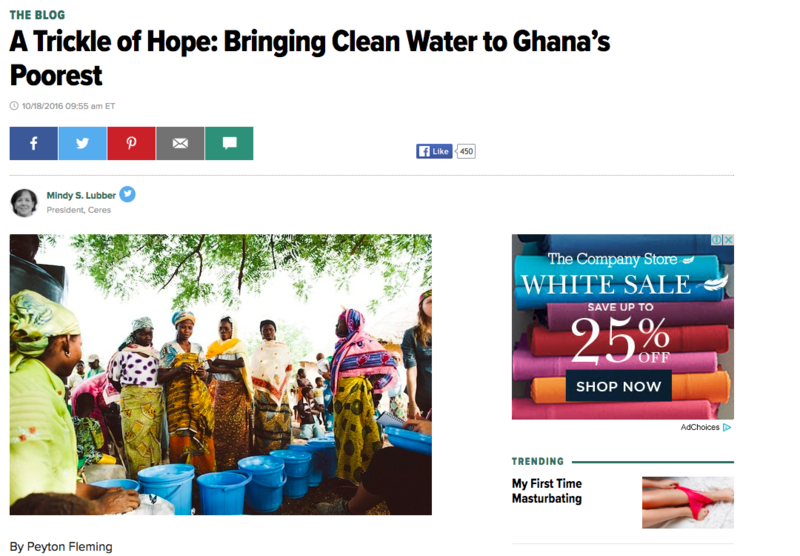 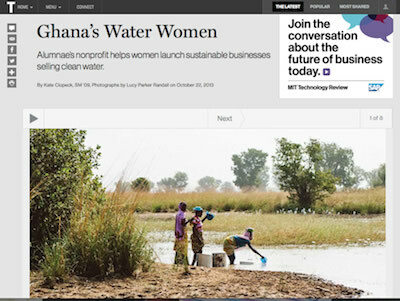 Journalist, Tom Murphy, publishes an article on Humanosphere titled “These Women Bring Light and Clean Water to their Community in Ghana” where he talks with Saha entrepreneurs Ayi and Fusiena from Kurugu Vohyili. 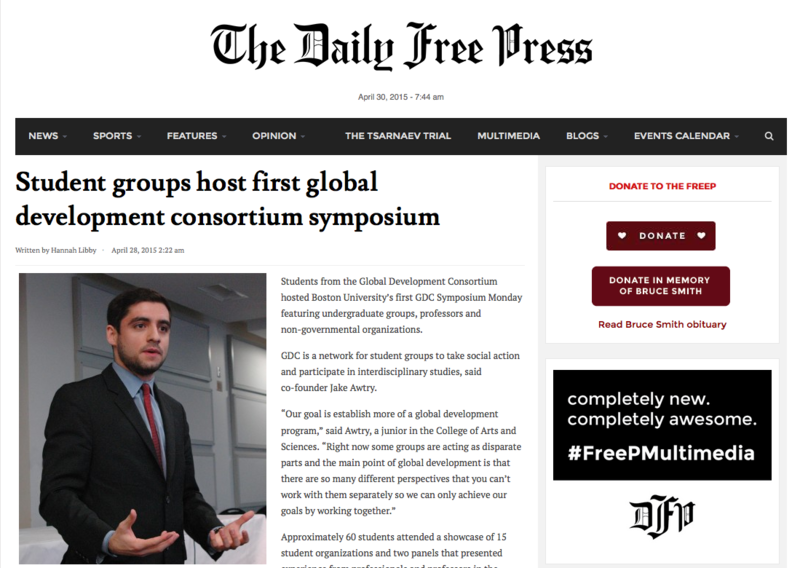 “The Daily Press” published an article about Boston University’s Global Development Consortium Symposium where they interviewed Kate, who spoke at the event, about her passion for the field. 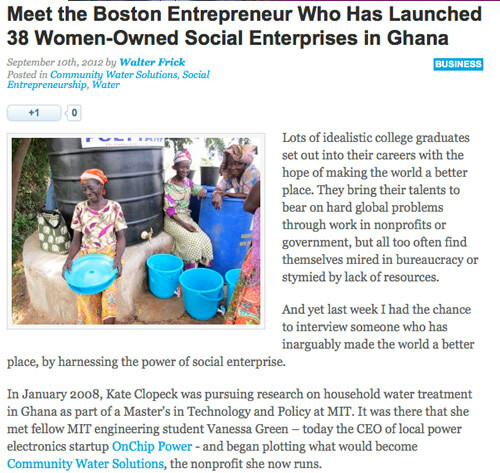 Executive Director, Kate Clopeck, and Manager, Eric Angkosaala’s “Empowering Women Entrepreneurs Though Access to Water In Ghana” blog post in WASH Advocates’ WASH and the MDGs blog series on The Huffington Post features Azara (Kpachiyili), Lachia (Tacpuli), and Fati (Tohinayili) and what access to water and women’s empowerment mean to them. 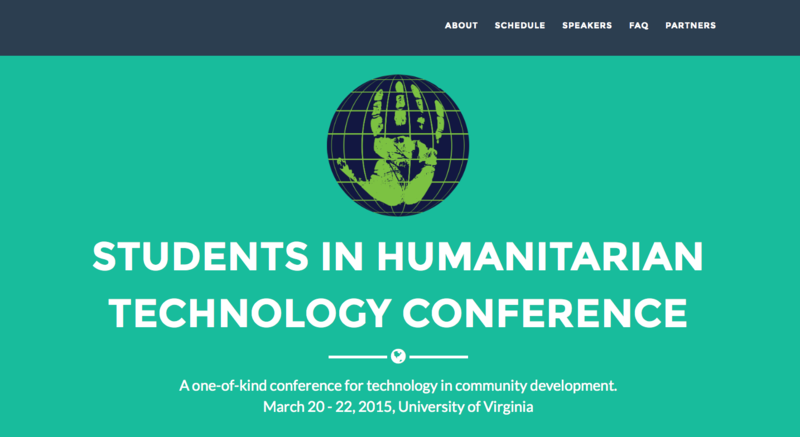 Executive Director and Co-founder, Kate Clopeck, spoke at the 2015 Humanitarian Technology Conference. 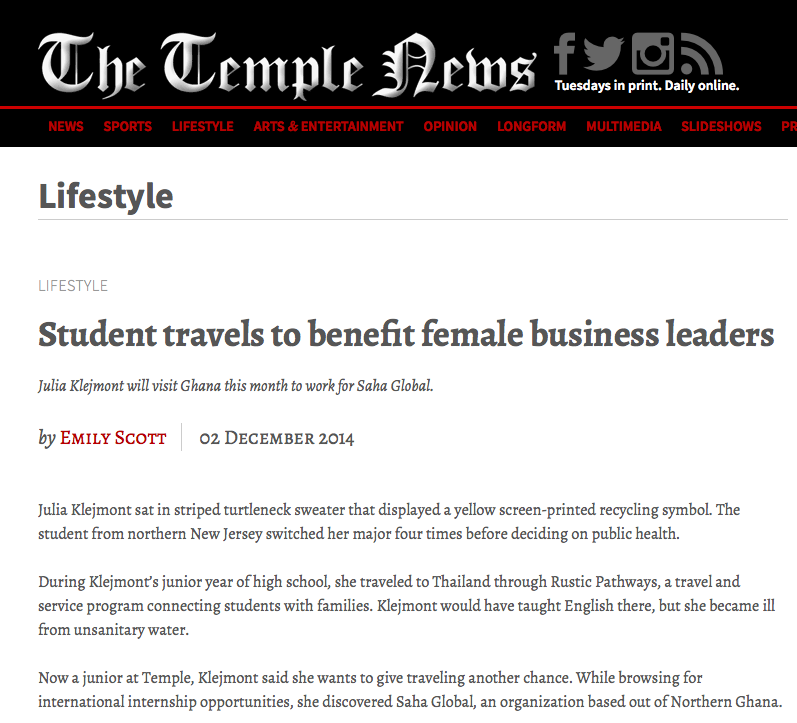 An article in The Temple News featured 2015 Winter Field Rep Julia Klejmont. 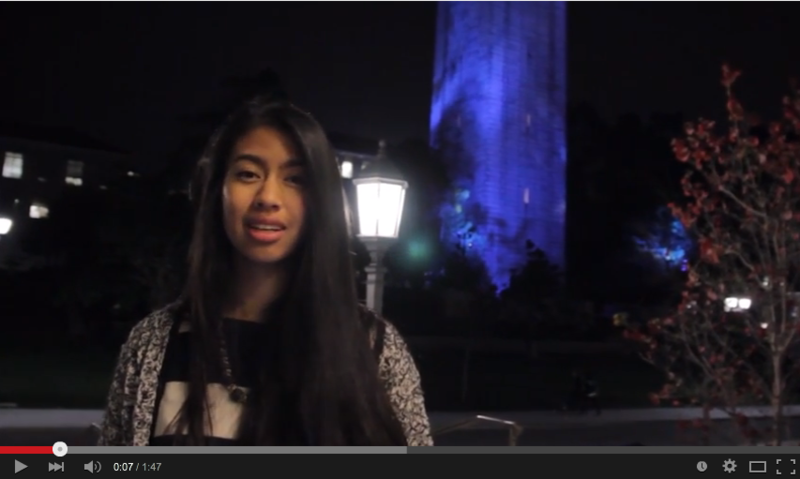 2015 Winter Solar Field Rep Julia Solano published an awesome YouTube video for her fundraising campaign for the Global Leadership Program. 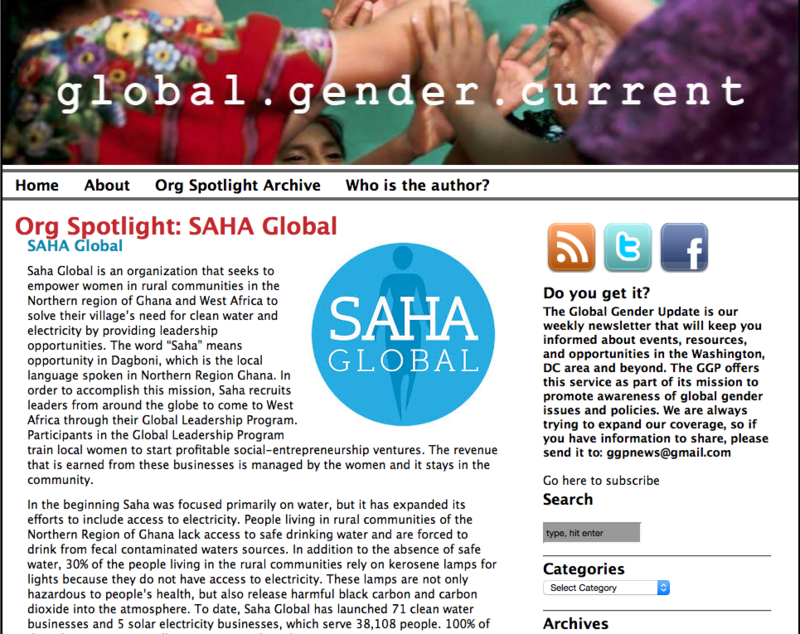 Saha Global was a spotlight organization on The Global Gender Current blog. 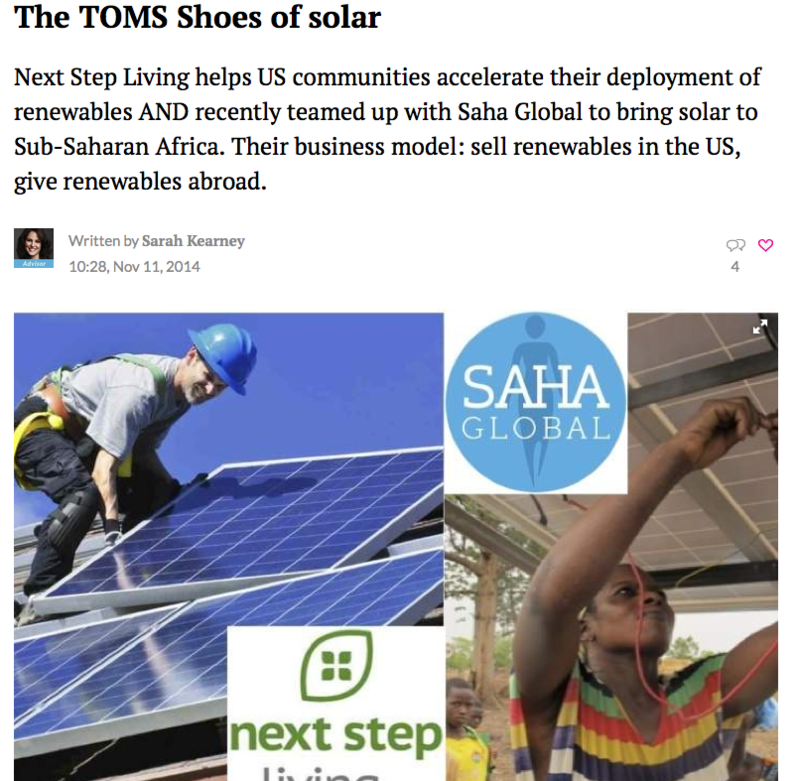 Saha Board Member, Sarah Kearney’s article “The TOMS Shoes of Solar” on OpenIDEO talkes about our awesome partnership with Next Step Living. 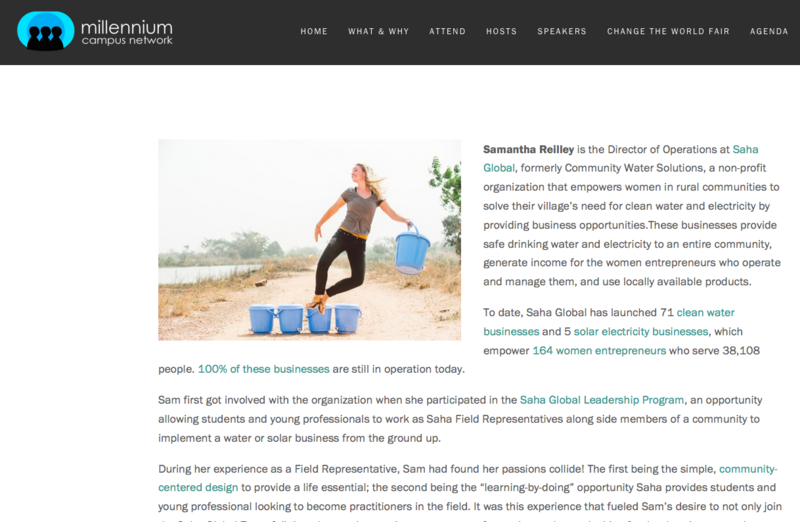 Director of Operations, Sam Reilley, speaks on grass roots vs. grass tops debate at Millennium Campus Network Conference. 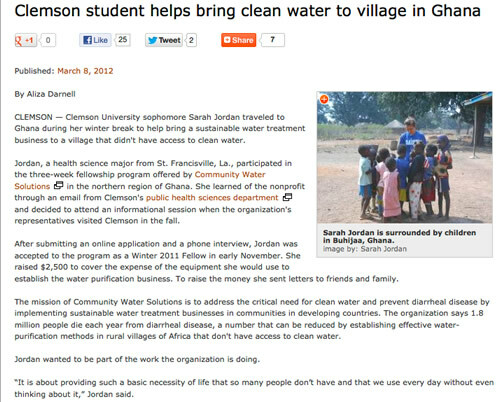 Sam Reilley, 2011 Winter Field Rep, spoke about her experience at Clemson University and how that led her to Saha Global. 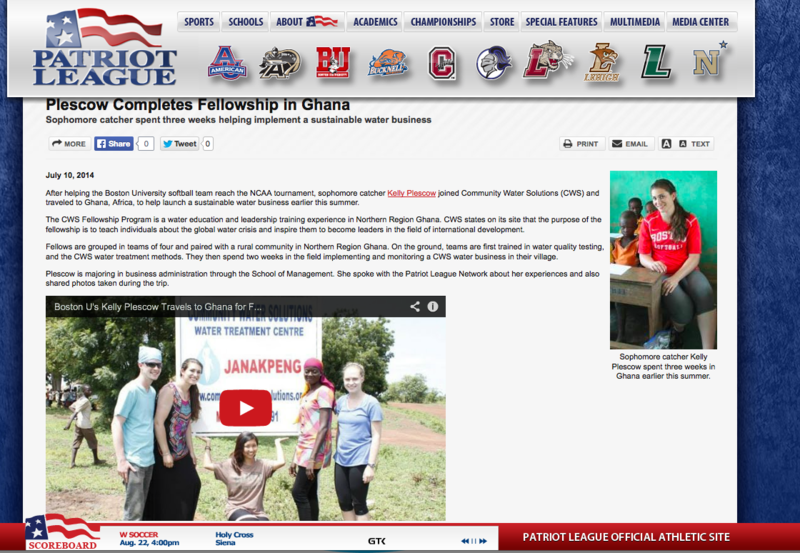 Saha Global Field Rep, Kelly Plescow interviewed on the Patriot League Network. 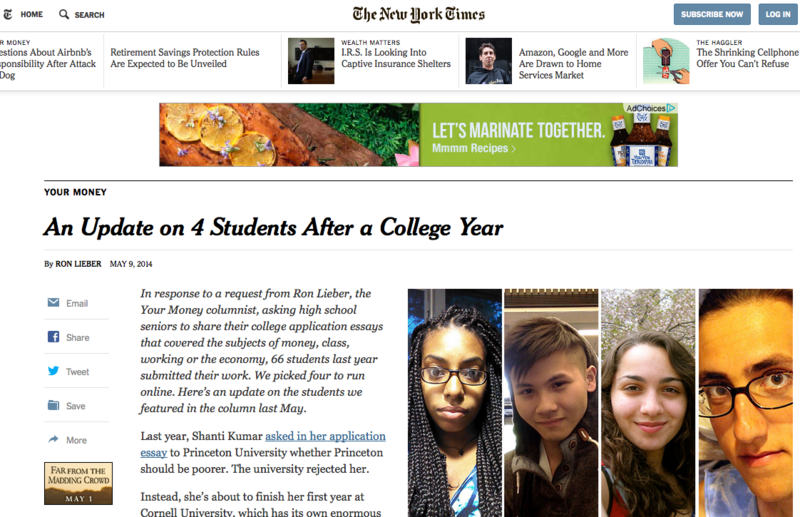 The New York Times published the article “An Update on 4 Students After A College Year” and featured 2014 Summer Field Rep Ana Castro Reynoso. 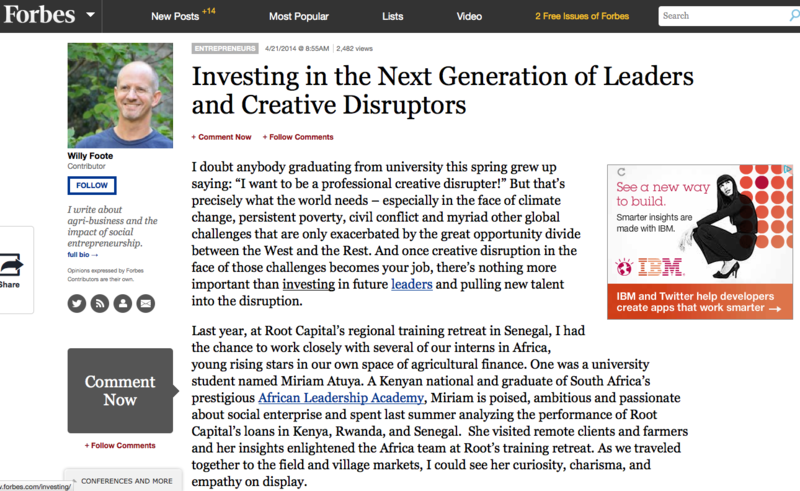 A Forbes article titled “Investing in the Next Generation of Leaders and Creative Distributors” highlights the importance of investing in next generation leaders and features 2014 Winter Field Rep Miriam Atuya. 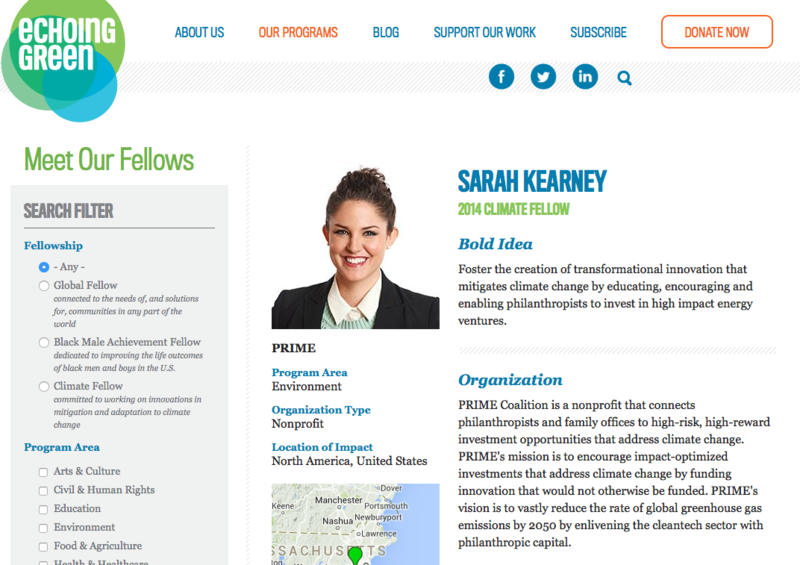 Saha Global’s Board Member Sarah Kearney was named 2014 Echoing Green Climate Fellow. 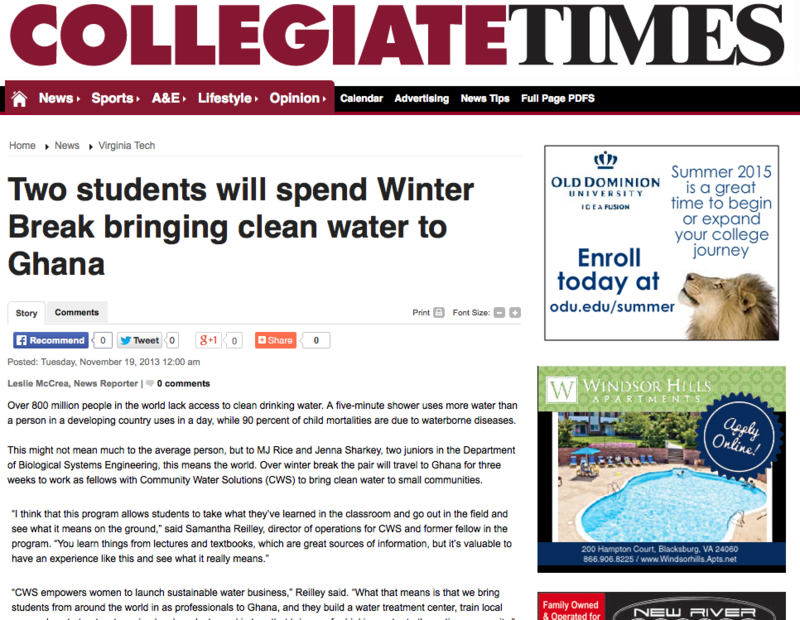 Virginia Tech’s Collegiate Times published an article about 2014 Winter Field Reps students, MJ Rice & Jenna Sharkey. 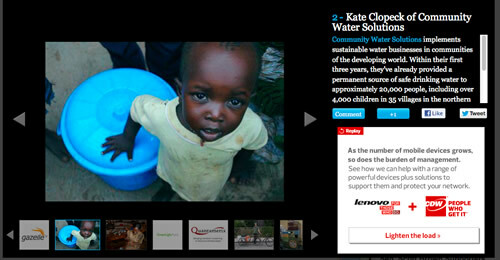 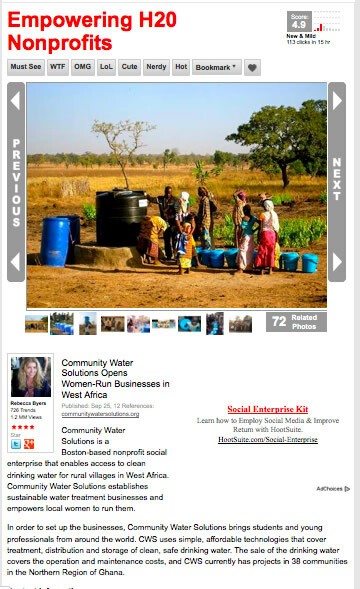 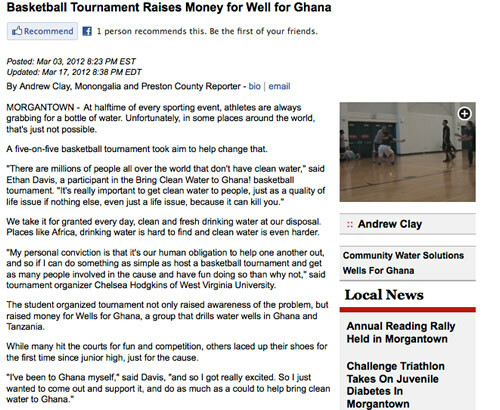 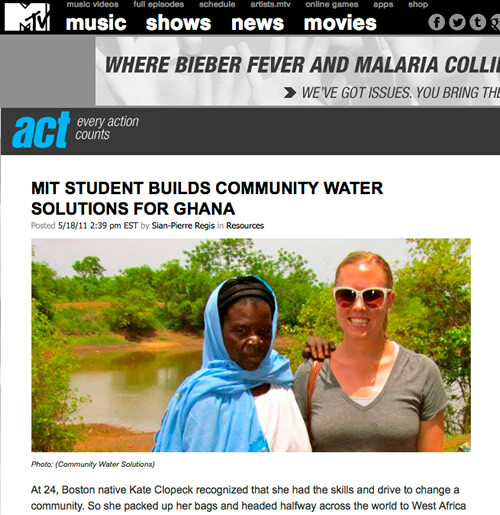 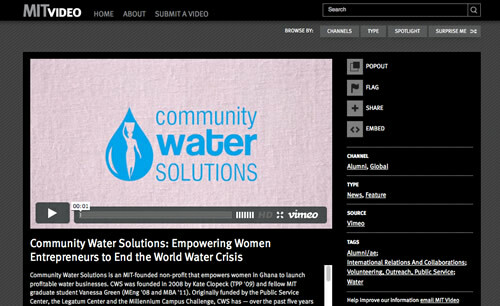 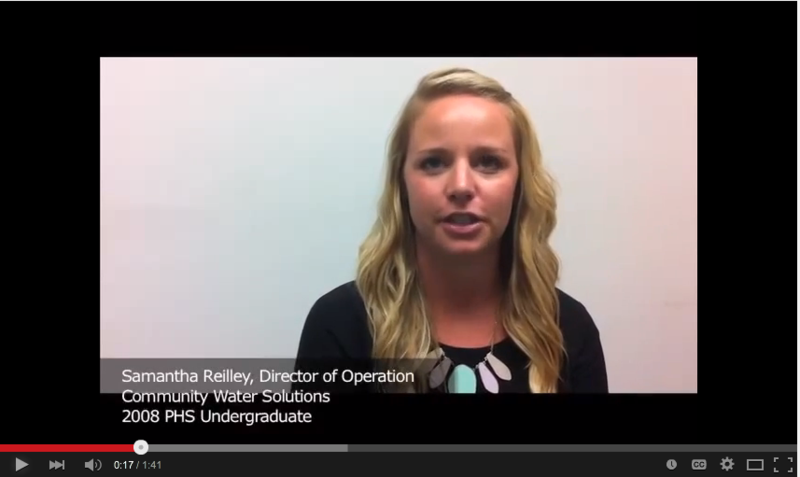 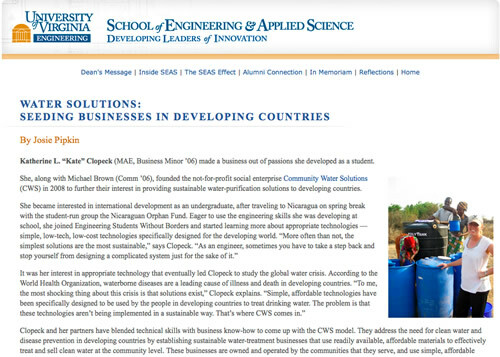 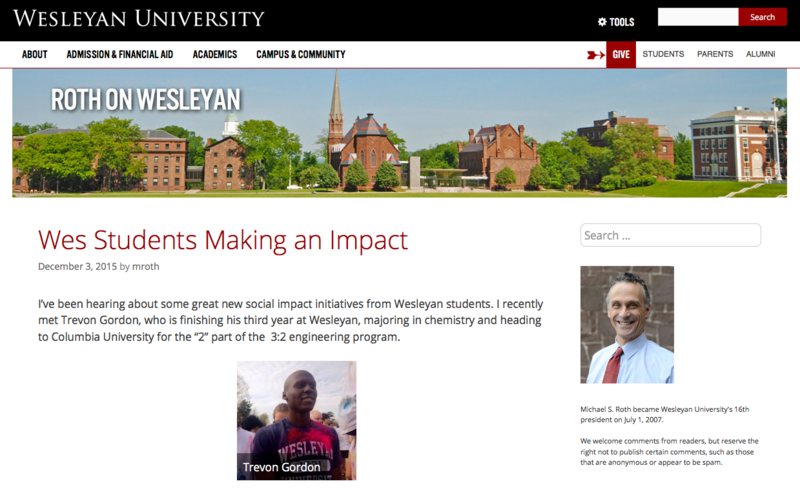 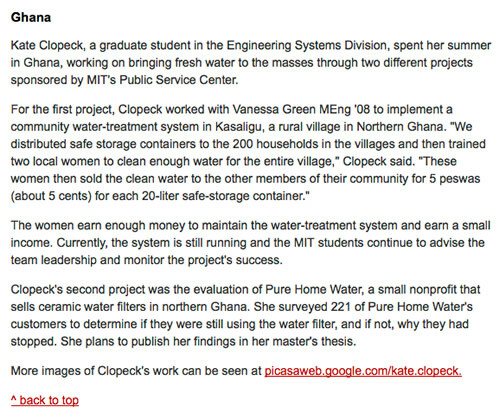 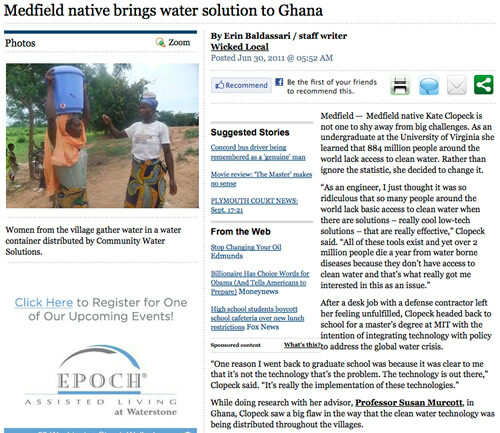 Community Water Solutions featured in the MIT Technology Review. 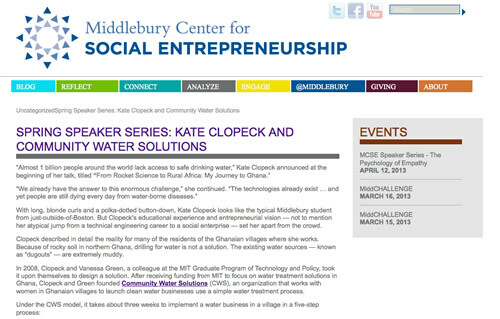 Community Water Solutions awarded the New England Innovation Award! 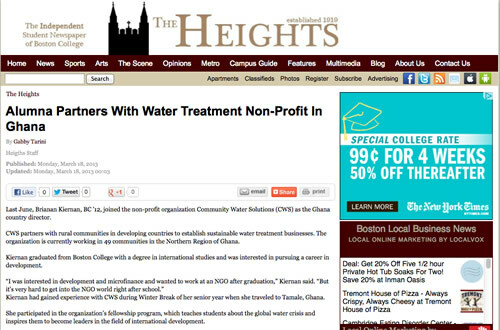 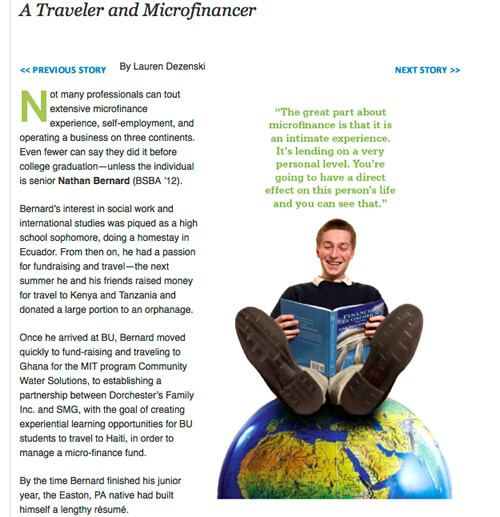 Read more about this prestigous award in this article by the Boston Business Journal. 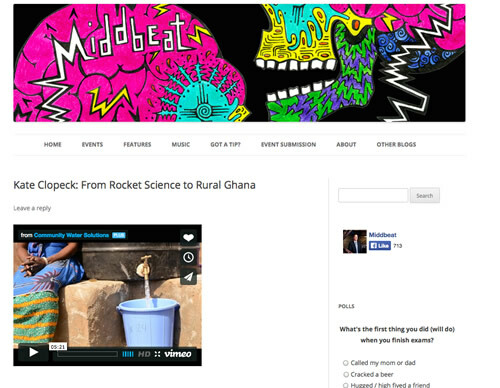 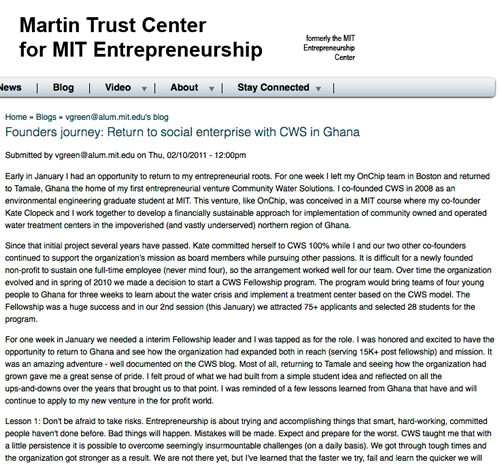 Kate Clopeck has a youtube video published titled “From Rocket Science to Rural Africa, My Journey to Africa” from a presentation at Middlebury College and highlights how CWS came to be and what we are all about. 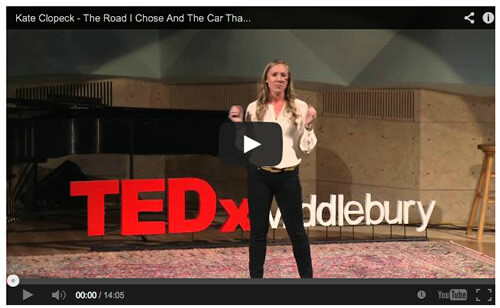 CWS Excecutive Director, Kate Clopeck, spoke at Tedx Middlbury! 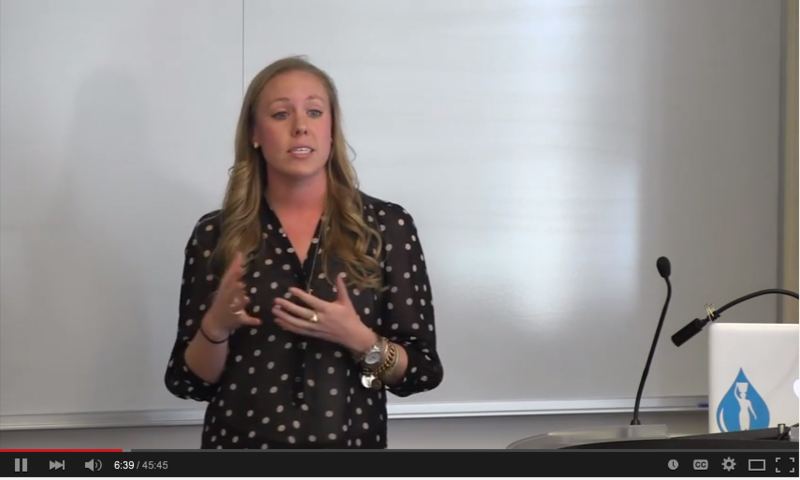 Check out her talk here!